My husband and I moved to Steamboat to open Ski Butlers nearly a decade ago. In our 20s and with fiery hearts, we plunged into an industry that we were passionate about but also understood the challenges of. There were a handful of naysayers and pessimists as we opened our doors that first winter, but we paid them little attention and set out for success and hopefully some fun. 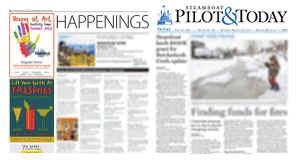 In true Steamboat spirit, the naysayers quickly faded, and the majority of local businesses and community members embraced us. This community has shown us support since the day we opened our doors as young entrepreneurs and eager philanthropists. We’ve grown from a single car garage to a bustling stand-alone location with multiple vans and a team worth more than any words can describe. I’m finding myself reflecting on how it began for us here in Steamboat because of the recent negative energy toward expanded affordable housing. This community has supported us as young professionals from the beginning and to think that those seeking a similar dream are having to settle elsewhere because of the inability to find a home is heartbreaking. Our community-elected — please don’t forget this detail — City Council has listened carefully to the Brynn Grey Partners, who have a proven track record building hundreds of homes for high country families. This dedicated group has been working relentlessly to build an impressive vision for the west area of Steamboat, which our elected officials and community — over three years of collaboration — have approved a plan. Let’s not take this progress lightly. As a small business owner and as a mom, this momentum is crucial to me personally. My employees need homes, my kids’ teachers need homes and those who bag our groceries, drive our buses and serve us food at our favorite restaurants need homes. These people, just as much as those who have retired or have second homes here, are the threads of our community. Let’s work together and do all we can to enable everyone to both live and thrive here. Trust your city councilmen and councilwomen. Think of what allows you to live here. Think of the next generation of dream chasers that deserve a chance to lay roots in Steamboat. And please, think twice about signing anything that may derail our progress and positive momentum. Signing the Let’s Vote Petition will only delay this process even further.